possibly Govert Flinck [1615-1660]; Nicolaes Anthoni Flinck [1646-1723] (Lugt 959), Rotterdam; William Cavendish, 2nd Duke of Devonshire [1672-1729]; by descent at Devonshire House and Chatsworth (inv.no.1032) (sale, Christie's, London, 3 July 1984, lot 63); John R. Gaines, Lexington, KY (sale, Sotheby's, New York 17 November 1986, lot 19); purchased by Ian Woodner, New York; by inheritance to his daughters, Andrea and Dian Woodner, New York; gift 1993, to NGA. Exhibition of Dutch Art, Royal Academy, London, 1929, no. 608. Old Master Drawings from Chatworth, Arts Council of Great Britain, London, 1949, no. 36. Rembrandt, Nationalmuseum, Stockholm, 1956, no. 134. Old Master Drawings from Chatsworth, City Art Gallery, Manchester, 1961, no. 93. Old Master Drawings from Chatsworth: A Loan Exhibition from the Devonshire Collection, National Gallery of Art, Washington and tour, 1969-1970, no. 93. 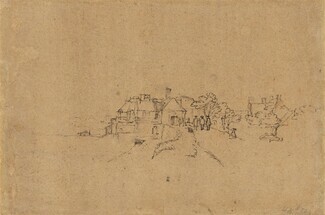 Old Master Drawings from Chatsworth: A Loan Exhibition from the Devonshire Collection, Victoria and Albert Museum, London, 1973-74, no. 93. Master Drawings: The Woodner Collection, Royal Academy of Arts, London, 1987, no. 65. Woodner Collection, Master Drawings, Metropolitan Museum of Art, New York, 1990, no. 80. The Touch of the Artist: Master Drawings from the Woodner Collections, National Gallery of Art, Washington, 1995-1996, no. 72. Rembrandt et Amsterdam: Promenades avec Rembrandt dans la ville d'Amsterdam et ses alentours, Gemeentearchief Amsterdam, Institut Néerlandais, Paris, 1998-1999, cat. no. 37, plates 55, 62. Art for the Nation: Collecting for a New Century, National Gallery of Art, Washington, 2000-2001, unnumbered catalogue. Rembrandt, Albertina, Vienna, 2004, no. 163. Lippmann, Friedrich and Cornelis Hofstede de Groot. Original Drawings by Rembrandt Harmensz van Rijn Reproduced in Phototype. 4 vols. Berlin, 1888-1911: II: no. 58. Hofstede de Groot, Cornelis. Die Handzeichnungen Rembrandts. Haarlem 1906: no. 846. Eisler, Max. Rembrandt als Landschafter. Munich, 1918: 65. Lugt, Frits. Mit Rembrandt in Amsterdam. Berlin, 1920: 107, 133, no. 82 (repro. of recto only). Benesch, Otto. Rembrandt: Werk und Forschung. Vienna, 1935: 48. Wimmer, G. Rembrandts Landschafts-Zeichnungen. Frankfurt-am-Main, 1935: 65. Benesch, Otto. Rembrandt, Selected Drawings. New York, 1947: 26, no. 181 (repro. of recto only). Benesch, Otto. The Drawings of Rembrandt. 6 vols. London, 1954-1957: 6(1957):no. 1261, figs. 1485, 1486. Slive, Seymour. Drawings of Rembrandt. 2 vols. New York, 1965: I: no. 58 (repro. of recto only). Benesch, Otto. Rembrandt, Werk und Forschung. Lucerne, 1970: 48. Melikian, Souren. "A Master Collector, Ian Woodner: An Eye for the Future." Art & Auction. (November 1987): 87. Giltaij, Jeroen. The Drawings by Rembrandt and His School in the Museum Boyman-van Beuningen. Exh. cat. Rotterdam, 1988: mentioned under no. 18 (verso reproduced fig. a). Royalton-Kisch, Martin. 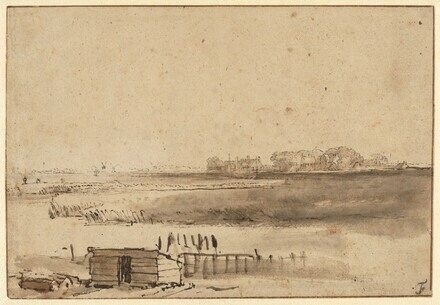 "Rembrandt's Landscape Drawings." Drawing: Masters and Methods. Raphael to Redon. Papers presented to the Ian Woodner Master Drawings Symposium at the Royal Academy of Arts, London. London, 1992: 114-115, figs. 1, 2. Jones, Jennifer. "The Woodner Collections at the National Gallery." Drawing 17 (September-October 1995): 49-53 (repr. recto fig. 8). The Touch of the Artist: Master Drawings from the Woodner Collections. Exh. cat. National Gallery of Art, Washington, 1995-1996: nos. 72a and 72b.